Yogesh Chabria - The Happionaire ​Blog - Best Motivational Speakers In India - Inspiration, Success: Happionaire’s Money Game Is Here! Happionaire’s Money Game Is Here! I know that not many children read this blog. If I recall correctly, I think our youngest reader is 15 or 16 years old, while our oldest is over 80. I really hope that changes once more children out there read our new book – Happionaire’s Money Game. I would like to confess that while writing this book, not only did I have lots of fun; but I actually ended up going back to the days when I was a child. I am glad my parents taught me about money, finance and banking when I was a child, because as children we are able to learn much faster provided it is made fun and interesting. Try learning a new language as a child and try learning it as an adult, which do you think is going to be faster and easier? Luckily children’s minds don’t have any limitations; they don’t know what is impossible. An adult on the other hand, overtime based on his experiences is made to believe that lots of things are impossible. I still continue to think like a child and it is truly incredible. I know most people in the world of conventional finance would not want finance to be mixed with super heroes and pav bhajji, but they need to realize that if we want each and every Indian to be financially literate and empowered, we need to speak the language they understand. Education needs to be made more interesting, fun and relevant to the real world. The fact is that people from old school finance, do not want the masses learning about it. If people become too intelligent, it becomes hard to fool them and manipulate them. As a student, I never understood why our education system paid absolutely no attention to finance and the financially well being of students. We were never taught about money or how we can save, make and grow our money. We were never encouraged to think like investors and entrepreneurs and we were never encouraged to think about how we can bring about change. It isn’t the fault of extremely hard working teachers and academicians, but the fault of the system that was introduced to us by the British hundreds of years ago. It was a system meant to train Indians to being submissive clerks. Today we need a system that will help our nation’s young minds to think about building a nation of wealth, power and happiness. To be a super power, we don’t just need wealth – but also smiles and happiness. What is the use of being wealthy, if you are constantly depressed and have no family and love? We will then be able to spread our ways to the rest of the world. Love and smiles, definitely have much more power than any weapon of mass destruction. Winning hearts is the greatest conquest ever. For our nation and society to progress, we need to make sure our future generations are well invested into. We can’t have our children getting addicted to unnecessary debt and living a life where they are unable to understand money. We can’t have them live a life where materialism takes more importance than family values, love, friendship, happiness and spirituality. 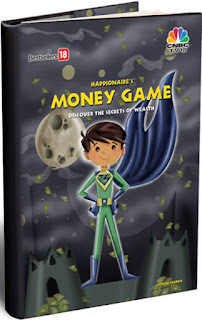 Happionaire’s Money Game, helps develop financial literacy in children and at the same time makes finance entertaining and exciting. It is written in the form of a story and I really do hope that all my young friends out there enjoy reading it. I look forward to views not just from children, but also from parents, teachers and anyone who has a stake in India’s future. The select few who have already read it, have been extremely kind enough to share their views. I thank all of you from the bottom of my heart once again, for helping the Happionaire way spread across the world. Without you nothing would have been possible. Keep smiling and keep investing! Share your views on the above post in our comments section here. Can Real Estate Prices Crash 70% Across India? "Making Things Simple Is Very Difficult - But Extremely Profitable." Congratulation to all Happionaires. I am sure chiuldren will love it and I will be buying one for my son immediately! I am younger. I am 14 years old and my father gave me your book to read.I also want to follow the right path and make my family and nation proud. Congratulations. Will try to share it with the younger classes in my school. INVESTMENT IS NOT A CHILD'S PLAY. It calls for a certain degree of maturity. Agreed,The ground should be prepared during the graduation stage. Ok as Promised, again I am posting one more story. This relates to all we happionaires out there. Please go through it, it'll definitely bring a smile on your face and leave a lesson in our minds. There once was a King who offered a prize to the artist who would paint the best picture of peace. Many artists tried. The King looked at all the pictures, but there were only two he really liked and he had to choose between them. One picture was of a calm lake. The lake was a perfect mirror, for peaceful towering mountains were all around it. Overhead was a blue sky with fluffy white clouds. All who saw this picture thought that it was a perfect picture of peace. The other picture had mountains, too. But these were rugged and bare. Above was an angry sky from which rain fell and in which lightening played. Down the side of the mountain tumbled a foaming waterfall. This did not look peaceful at all. But when the King looked, he saw behind the waterfall a tiny bush growing in a crack in the rock. In the bush a mother bird had built her nest. There, in the midst of the rush of angry water, sat the mother bird on her nest in perfect peace. Which picture do you think won the prize? The King chose the second picture. Do you know why? Congratulations for Happionaire's Money Game! It is a must for kids these days. Will pick it up for my daughters for sure. Thanks Zaki for the lovely words. I am also very proud to see that youngsters like you are going to be the future of our great nation and are interested in wealth creation. Keep smiling, having fun and learning! Namaste! I couldn't find the book - "HAPPIONAIRE'S MONEY GAME" anywhere online. First of all it was challenge to search - CNBC TV 18 has removed the link from their site and spend quite a time on searching somewhere else and finally when I found at one place (http://www.bookzone.in/proddetail.asp?prod=1142), it seems this is out of stock. I would appreciate if you can provide me the source where I can get it in Pune. I too noticed that the CNBC's website has for some strange reasons suddenly removed all books. Is this a sort of copy of Rich Dad's CASH FLOW game? Super Excited to Share Succeed The Happionaire Way With You - Free Preview Copy! Who is A Happionaire According To You? Invest The Happionaire™ Way Is Here!